If you’re too embarrassed to show off your home, then it’s a sign you should do some heavy-duty cleaning. Here are some ways to you can set up an event to clean up your Parkton neighborhood with roll-off containers. Now that Halloween has come and gone, it’s time to turn your attention to two other holidays left on the calendar: Thanksgiving and Christmas. These two holidays are meant for spending time with friends and family, and your neighbors. But if you’re too embarrassed to show off your home, then it’s a sign you should do some heavy-duty cleaning. Here are some ways to you can set up an event to clean up your Parkton neighborhood with roll-off containers. The first thing you will want to do is spread the word. With the holidays so close, your Parkton neighbors will probably be thinking about their decorations or making plans to go out of town, so you’ll need to get their attention. 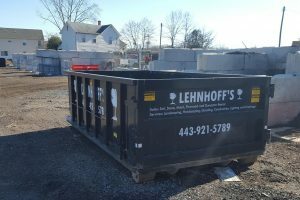 Although it’s easy enough to clean out your own home with a roll-off container, the idea is to make the event something like a block party. Make some flyers and distribute them at least a week before you plan to do the cleanup. Giving your neighbors plenty of advance notice is a great idea. Just be sure to run it by your HOA or property managers if you live in a rental community. The next step is to rent several roll-off containers. You can split the cost with your neighbors if it is going to be a joint project, especially if you are disposing of large amounts of trash, junk, rotten fencing, or broken siding. If all of the trees in your neighborhood have fallen, then you can use a roll-off container to hold them until they can be properly disposed of. You will also need to collect other tools and supplies you will need. One idea is to have someone donate all the gardening tools, and another to pick up the tab on mulch and other yard supplies that you can put down after clearing away used-up topsoil and dead plants. Once everything is taken care of, it’s time to have a party! Although parties of this nature are more common during the warm, breezy days of spring and summer, that doesn’t mean you can’t have your very own fall festival in your Parkton neighborhood. Why wait until spring to have a fresh start? This entry was posted on Friday, November 16th, 2018 at 12:02 pm. Both comments and pings are currently closed.